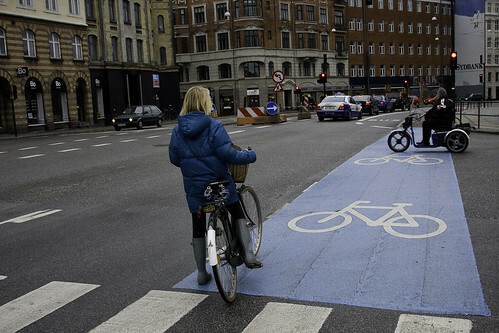 They do take cycling seriously in Copenhagen - you can't miss that blue paint ! haha. a short way for cycling. Now I know where I want to move to!! we have similar lanes in Long Beach,Ca - which are painted green. Cars are still allowed to drive in them if there are no bicycles present. It would be nice to have painted Bike-only lanes though! I plan to visit Copenhagen in late June. The contrarian in me wonders if the blue area is also "bike jail"; what happens to bicyclists who use the normal lanes? In Amsterdam I got honked at/ostracized for leaving the cycle tracks to make the normal movements allowed to bicyclists in the USA, like left turns. Very nice picture, as always! I really enjoyed Copenhagen riding when I visited the city, two years ago. You are extremely lucky to leave in such a cycling city! @Eva, this is not a lane as such. They are there to mark where the bikes will pass, in the intersection. If you look at the google-maps view, you can see that there's a lane on each side of the intersection, and a blue marking inbetween. Due south is a painted bike-only lane. @Jim Baross, following US traffic regulations in other countries will get you honked at. You shouldn't be surprised at that. i see what you mean William - that is still a great safety precaution & a nice courtesy for cyclists!